As I’m typing this, Nottingham’s bid to become a UNESCO City of Literature is being electronically submitted to UNESCO UK, who, if they decide to support it, will send the bid to UNESCO’s director-general next week. On our City of Literature website we’ve published a long letter from the city’s great and good (University Vice-Chancellors, MPs, a rich array of civic and business leaders), demonstrating their support of the bid. It’s been a busy year, and a particularly hectic last few days, in which we rewrote the bid in the light of a helpful review of the initial draft from UNESCO UK. I’m proud of the the bid we’ve written, which, I believe, represents the city’s thriving literature scene and creative infrastructure in an honest, exciting way. In the process of getting the bid together, the company that we’ve formed to write the bid has started to make things happen, and has already made our literary, literacy and Creative Writing organisations more joined up, capable of even greater things. So, tomorrow, for instance, a bunch of us meet to discuss next year’s biennial Festival of Words – I don’t want to pre-empt that discussion, but it’s likely to have an even more international flavour. And, a week on Friday, at the Council House, we formally launch the biggest project that has come from the City of Literature company so far. The These Seven stories anthology, a quarter of whose print run will be given away, and the Big City Read, where numerous groups – most of them young people – will read the anthology, meet the writers and do some writing themselves. I’d like to thank everybody who’s helped with the bid: our Project Director, Pippa Hennessy, of course, and Matt Turpin, both of whom did far more work than they were paid for, our researcher, Jay Arnold, Paul Fillingham, Sharon Scaniglia, Sally Bowden, Jo Guy, Pat Thomson, all of the board members and working group, our student helpers Phoelyx Delany, Chris Jelfs and Ula Wronska, Danny Hahn of the Society of Authors, Bernie Corbett of the Writers’ Guild, all of our patrons, the new Lord Mayor, Jackie Morris and everybody who contributed to the review of the bid first draft. Lastly, Stephen Lowe, pictured above. Steve kicked the whole thing off at the first Festival of Words, in a Writers Guild discussion that I attended. A fine playwright and scriptwriter with a long record of voluntary public service, he’s President of Bromley House Library who funded the initial bid exploration. Despite serious illness that prevented him from chairing the bid company, a job I took on, Stephen accepted the role of being our honorary president. Last week the city honoured Stephen by naming one of our new trams after him. It was a lovely occasion and I can’t think of anybody who deserves it more. The new trams roll out any day now but can’t be used yet. 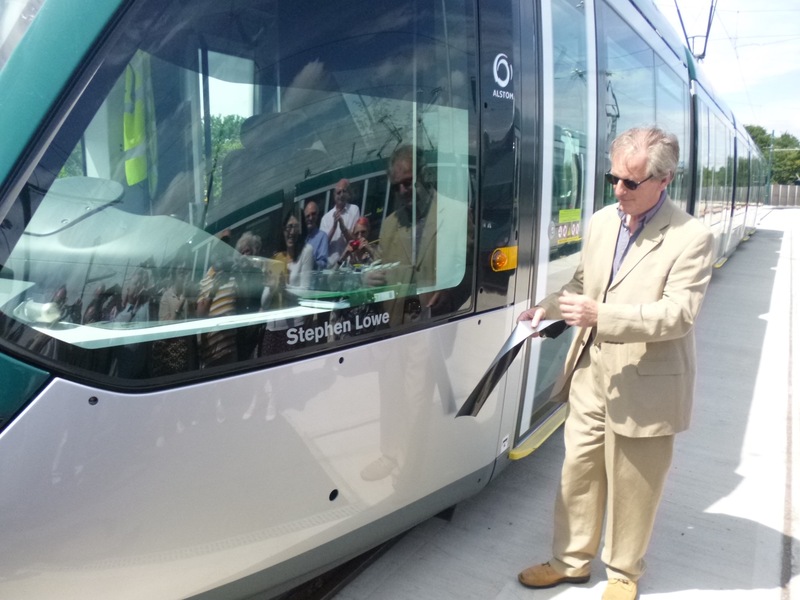 Serendipitiously, however, a big crowd of us rode back into the city centre on the tram that we named on the night our bid was launched, eight long months ago. Alan Sillitoe’s tram. I’ve named lots of people above, but want to stress that our City Of Literature bid is not the work of a small committee or some elite drawn from one section of the community. Rather, it represents a rich, diverse range of talented people, all involved in the flourishing city of literature we live in. It belongs to everybody. For that reason, presuming that UNESCO are OK with it, we plan to put the full bid and supporting letters on our website next week, for everybody to see, discuss and celebrate. If we get through the next stage, the result will be announced on December 11th. Update: I’m pleased to report that UNESCO UK have endorsed our bid to become a UNESCO City of Literature and our bid has now been formally submitted. In the coming five months, we plan to act as though we’re already a city of literature – because, in every sense except the official accreditation, we already are – which means we’ll work at making the city’s literary scene even more joined up, promoting literacy, planning a festival and developing loads of new projects. For more information, visit our website. This entry was posted on Tuesday, July 7th, 2015 at 11:04 am	and is filed under General. You can follow any responses to this entry through the RSS 2.0 feed. You can leave a response, or trackback from your own site.